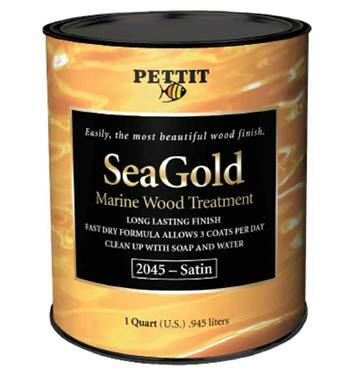 Pettit Marine Paint, leading manufacturer of high performance marine coatings, announced today that its award-winning SeaGold Satin Wood Treatment is now in stores. Bringing marine wood finishes into the 21st century, SeaGold offers the beauty and durability of varnish, and the ease of use of synthetic wood treatments, while being low-odor and low VOC (the amount of solvent released into the atmosphere). Designed with the user and the environment in mind, SeaGold is VOC compliant in all areas, and clean-up is simple with soap and water. Unlike many other wood treatments, SeaGold can be applied over existing varnishes. Its satin finish enhances the beauty of the wood, while its translucent amber color does not hide or blur wood’s natural grain. UV-stable resins have been combined with UV inhibitors as well as transparent pigments to provide a long-lasting finish that will not turn brown or orange with exposure to the elements. Its fast-drying formula also allows three to four coats to be applied in one day. At the 2016 International BoatBuilders’ Exhibition & Conference (IBEX), SeaGold Satin Wood Treatment was awarded the National Marine Manufacturers Association (NMMA) Innovation Award in the Boat Care and Maintenance category. The product was recognized for its ease of use and water-based application technology. SeaGold is available in quart cans for $44.99 from fine marine supply stores and boatyards throughout the United States. For more information on SeaGold or Pettit’s complete line of marine coatings, please visit www.pettitpaint.com.